Many would like to consign the polarising debate about “white monopoly capitalism” (WMC) in South Africa to the margins. They argue that its proponents are nothing more than Marxist ideologues or mischievous political manipulators. The extremes of racialised inequality in the country are not just an affront to social justice but are also politically explosive. Granted, the implementation of employment equity and Black Economic Empowerment (BEE) has somewhat ameliorated racialised patterns of wealth and ownership. But, no one should be surprised when black people at the bottom of the heap get angry. Neither should people be surprised that there are politicians who, for reasons good and ill, are willing to exploit that anger and mobilise around it. White monopoly capital was at its most cohesive and concentrated during the late phases of apartheid. In 1981, over 70% of the total assets of the top 138 companies were controlled by state corporations and eight privately-owned conglomerates. These spanned mining, manufacturing, construction, transport, agriculture and finance. Alongside the growing financialisation of the economy, there has been a shift in racial patterns of ownership. At the end of apartheid, companies listed on the JSE were almost wholly-owned by white South African investors. But, by 2016, (if we accept the calculations done by Alternative Prosperity) white South African ownership was down to just 22%. 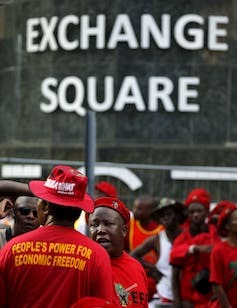 Julius Malema leads a protest by the Economic Freedom Fighters to the Johannesburg Stock Exchange. Critics such as Professor Chris Malikane, the economic adviser to Finance Minister Malusi Gigaba, have objected that the growth of black investment on the JSE is not significant. That’s because, they argue, black pension funds are largely controlled by white asset managers. And black direct investments via BEE schemes are largely funded through debt owed to white capital. These are certainly very real issues. But, is the main issue here the racial patterns of ownership and control – or the growing power of financial institutions and their lack of accountability? South Africa needs to devise far more inventive solutions than nationalisation to tackle the brutally unequal nature of its economy. Citizens need to pose profound questions about how to make international capital more accountable. They must ask questions about how to make the country’s corporate elite more accountable and how state capital can work productively with private capital while remaining responsive to local communities. And, yes, about how present patterns of corporate ownership can be not only deracialised but democratised.